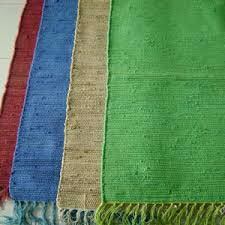 We bring forth a quality array of Plain Chindi Rugs in the market. These Plain Chindi Rugs are plain, and are available in numerous sizes and colors. Also, our range of Plain Chindi Rugs is resistant to shrinkage, pilling, and has a smooth texture. These Plain Chindi Rugs are durable, and easy to maintain and clean.